There is life up in the tree canopy. 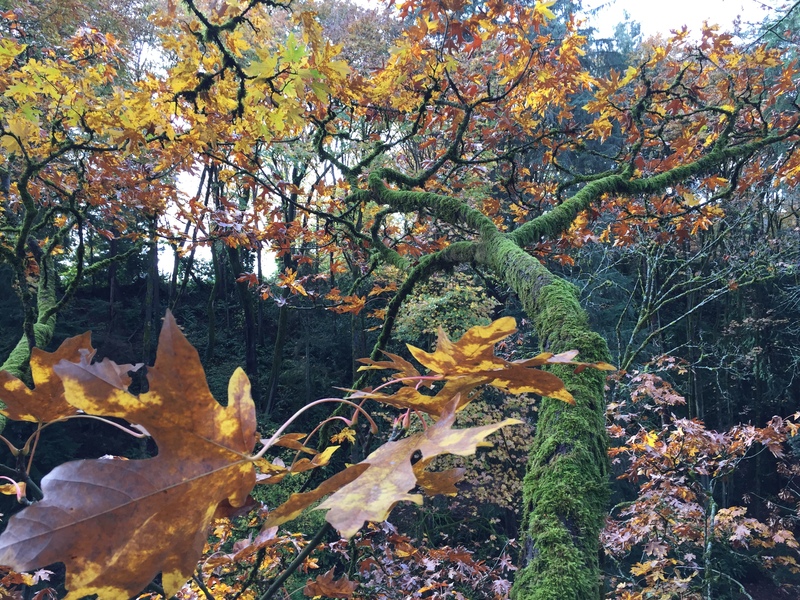 Amanda Bidwell climbs bigleaf maples. Finishing her Master’s work at University of Washington last June, she just shared some dazzling and troubling results about hot-spots of heavy metal pollution in our epiphytic mosses. Her analysis distinguishes between local and long-range sources of pollution. Many of the metals her team found are linked to impacts of Seattle’s transportation sector. Read more below about how Amanda’s research can teach us some valuable lessons about our ever-growing metropolis. Amanda Bidwell: As a part of my Master research project with the School of Environmental & Forest Sciences at UW, I reached out to Seattle City Parks and Recreation to establish some study sites within Seattle. The primary objective of my research was to see if moss could be used as an indicator of air quality and pollution. There is a long history of using moss as bioindicators to measure urban and industrial pollution in across Europe. Given the iconic image of moss-draped forests in the PNW, we were curious as to how these moss communities were responding to varying levels of pollution in the Western WA. What role do epiphytes play in the forest ecosystem in general, and urban forests in particular? Canopies are complex biogeochemical components of any ecosystems, serving as key sites for the accumulation and processing of nutrients and other chemical elements. In Seattle, canopy epiphytes provide hydrologic regulation; play a role in nitrogen and metal cycling; help form canopy soils; and provide habitat for microarthropods, insects, birds and mammals. Dramatic shifts in the abundance and diversity of epiphytic canopy communities, due to the direct influence from anthropogenic activities, will have a direct influence on forest ecosystem function and potentially alter ecological services throughout the region. We observed the highest levels of metals in the Seattle sites…. In particular we were looking at cadmium, chromium, copper, lead, manganese, nickel, strontium, titanium, and zinc. All of these elements are associated with transportation-based pollutants such as exhaust emissions, brake and tire attrition, and lubricant degradation. What sorts of epiphytes are you finding in the Seattle’s forested natural areas? Which epiphytes are you most interested in? Do we have a lot or a little in the city compared to other areas you study? Seattle’s forests are full of so many epiphytes, including mosses, liverworts, lichens and ferns. For this study we were interested in using a moss species we could find across all of our studies sites in Western WA. We chose 2 moss species: Isothecium stoloniferum and Kindbergia praelonga. We were able to use moss for this study as it is 1) nonvascular (lacks roots) and therefore absorbs all of it nutrients and water from the atmosphere, and 2) provides a snapshot of wet and dry pollution over a short period of time (maximum 2 year exposure period). Compared to the Western side of the Olympic Peninsula, there is a lot less epiphytic material in the urban canopy of Seattle. This is likely due to several factors including lower annual rainfall rates, higher temperatures, and larger inputs of urban pollution. How do you select the parks to sample? What kind of sampling did you carry out? 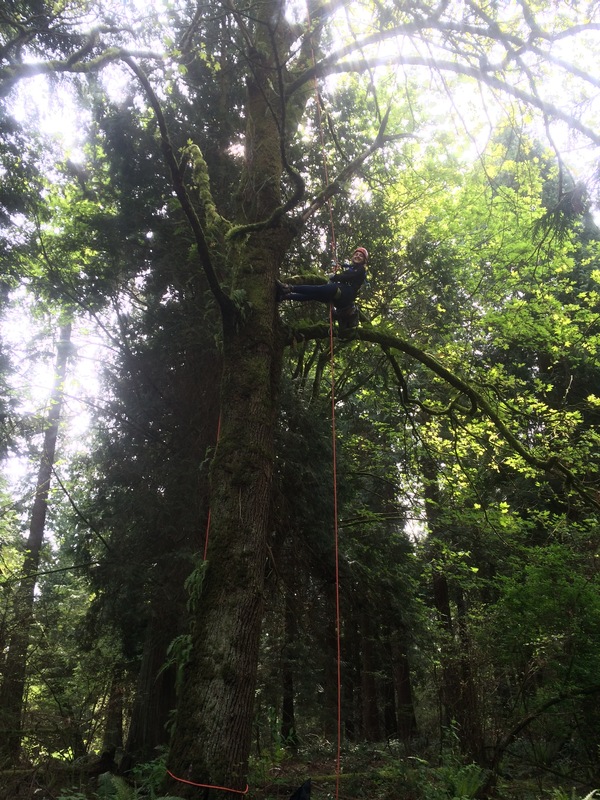 For the purposes of this study we were interested in using bigleaf maple trees as our sampling unit. We established sites on the Western side of the Olympic Peninsula to act as our “clean sites”, along the I-90 corridor to act as our “intermediate sites”, and sites in Seattle to act as the “polluted sites”. We also wanted to make sure we had a good distribution of park locations across both North and South Seattle so that we could get a representative sampling across the city. 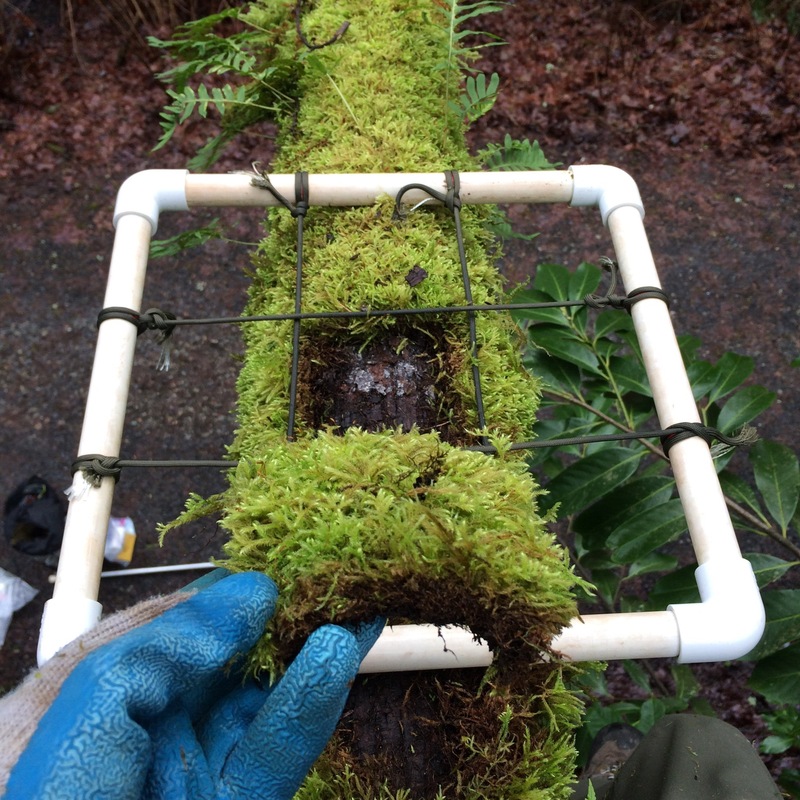 We used both canopy climbing techniques and ground floor sampling to collect moss samples from the 13 locations in Seattle across 4 sampling seasons (2016-2017). Getting up into the canopy provided a unique perspective from which to see our urban forests. 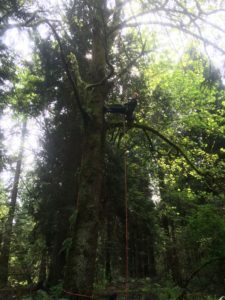 The forest canopy is a thriving, dynamic ecosystem that provides a variety of ecosystem services that is so important to our urban forests here in Seattle! Are you able to derive some conclusions about the impacts that transportation pollutants may have on the health of Seattle’s urban forest/forested parkland? Across all 4 sampling seasons, we observed the highest levels of metals in the Seattle sites compared to the I-90 corridor and the peninsula sites. In particular we were looking at cadmium, chromium, copper, lead, manganese, nickel, strontium, titanium, and zinc. All of these elements are associated with transportation-based pollutants such as exhaust emissions, brake and tire attrition, and lubricant degradation. The region-wide expansion in population growth and traffic is introducing more of these pollutants into the area and we were able to detect this in our moss samples. The elevated metal concentrations found in moss collected from Seattle sites were significantly correlated with heavier average daily traffic counts compared to the peninsula samples. As the Puget Sound Region is expected to experience significant population growth by 2040, increasing pressure from construction and the transportation sector is likely lead to higher levels of heavy metal pollutants in the region. * Results from this study suggest moss has the potential to be used as a low-cost biomonitor to evaluate heavy metal pollution in urban and rural areas. The values found in this study cannot be treated as an absolute measure of metal deposition, but rather used as a comparative index of metal deposition and a screening tool to assess areas of metal pollution.